Congratulations to the KL swimmers who qualify to advance to 62nd Malaysia Open Swimming Championship 2019 which will be held at National Aquatic Centre, Kuala Lumpur Sports City, Bukit Jalil from 25th April to 28th April, 2019. This event is a qualifying event for the FINA 2019 World Championships and 2020 Tokyo Olympic Games. We wish them all the best in Malaysia Open 2019. 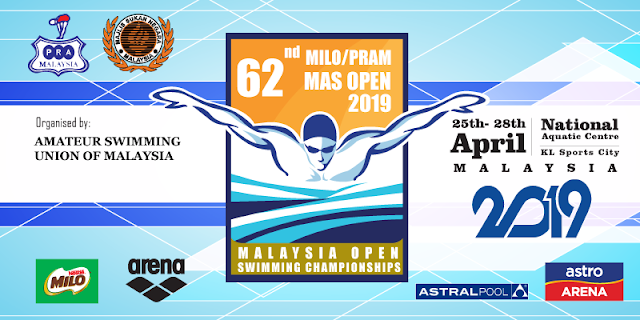 The Kuala Lumpur Amateur Swimming Association (PRAKL) is pleased to extend invitation to all Affiliates of PRAKL to participate in the MILO / PRAKL Age Group Swimming Championship 2019 to be held in Kuala Lumpur Swimming Complex, Jalan Yaacob Latif, Bandar Tun Razak, 56000 Kuala Lumpur. 28th December, 2018 (Fri), before 5:00 pm. 18th January, 2019 (Fri) at 3:30 pm. Attached herewith are the following appendices for your perusal. 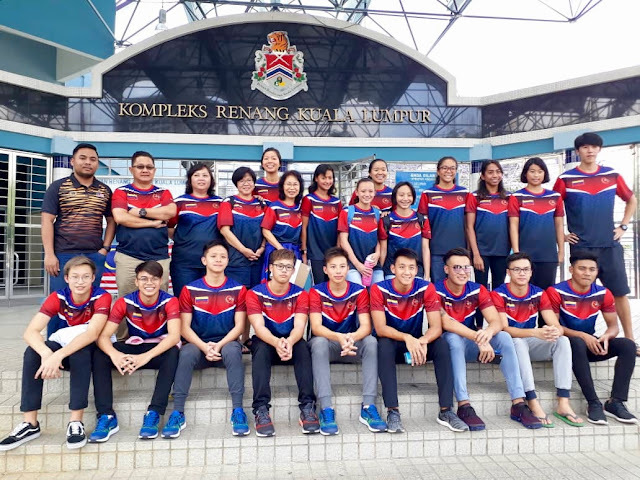 PRAKL wishes all the best to the swimmers representing Team WIPERS (Wilayah Persekutuan) at the SUKMA Perak 2018 which will commence on 17th to 21st September, 2018 at Pusat Akuatik Amanjaya, Perak. The team is departing Kuala Lumpur today to adapt themselves at the pool. Persatuan Renang Amatur Kuala Lumpur is pleased to extend our invitation to all swimmers who are qualified to participate in the SportExcel Grand Final 2018, to be held at National Aquatic Centre, Kuala Lumpur Sports City, Bukit Jalil from 11th to 12th August 2018. Attached herewith the qualifiers name list and relevant documents for your action. The closing date for submission of entries is at 5.00pm, Friday, 27th July 2018. Entries are to be submitted electronically via Hy-Tek Team Manager software and to be emailed to chuatb88@gmail.com before the closing date. Team with below 5 swimmers may submit entries by using the ENTRY Form(in Words format as enclosed with this email) via email to praklumpur@gmail.com . However, all entries must complete with the TEAM LIST. We look forward to your participation in the meet. 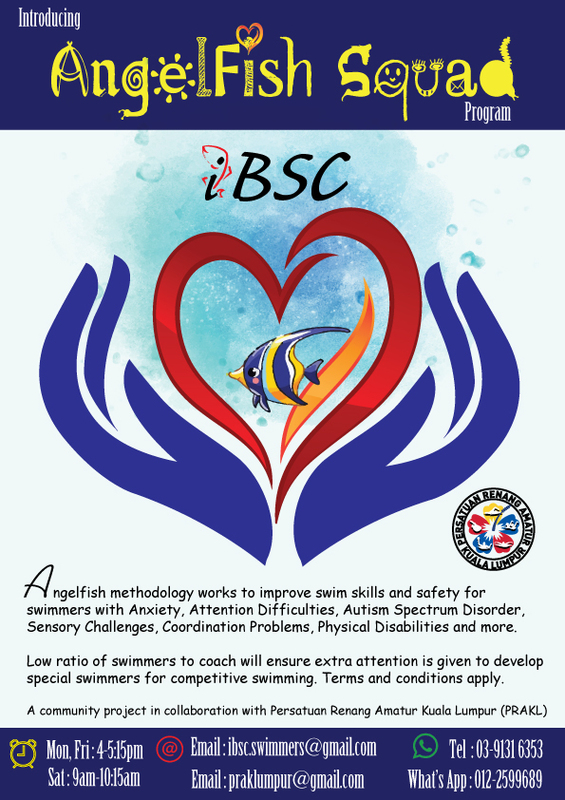 To help promote swimming as a sport to the special kids and eventually develop them to para swimming,we are pleased to introduce the AngelFish Squad program. With the experience and passion from our trained Coach Aswaie who has been involved in training children with special needs for years, we will ensure the Angelfish Squad gets the required attention they needed. Register with us by emailing us at praklumpur@gmail.com or ibsc.swimmers@gmail.com or Whats App 012-2599 689. Please download Registration Form.